Menaggio, Lake Como, splendid apartment in epoch villa in excellent conditions. Entrance hall, living with pretty fireplace, kitchen, bathroom with bathtub and balcony, double bedroom with balcony, bedroom, technical room with washing machine. Furnished. Large communal garden. Great investment! Lake Como is located in northern Italy, near Milan. The apartments and villas of Lake Como are in high demand thanks to the magical romantic landscape of the lake, attracting celebrities from all over the world, wishing to buy a property here. They are definitely an investment that maintain their value over time. 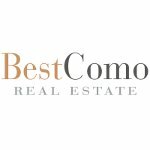 Best Como Immobiliare Sas offers a wide selection of properties for sale, luxury villas on the lake, historic villas to be renovated, modern villas, homes with views of Lake Como and serviced apartments or flats in the old villages. Our office is located in the center of Lake Como, Tremezzo, one of the most popular villages in Italy. If you are interested in buying a house on Lake Como or looking for safe investments in real estate, Best Como real estate agency offers properties that meet your every request.